Jim Sr. started his business in his father’s basement in 1980. In 1985 the original Ample Pantry restaurant was purchased and turned into what Rose Jewelers is today. Over the last 30 years we have performed the bench work for over 29 stores in Kalamazoo and Grand Rapids, performing over 1,000,000 repair jobs for various clients. In 2008, we decided to step out of the commercial jewelry repair business and skip the middle man. Offering our competitive low rates and quality work to the general public. As proud partners of Buy Local Kalamazoo, we believe that working with small business, and keeping money in the hands of local families, will help Kalamazoo grow as a community. Credentials: Over 40 years in the jewelry industry. 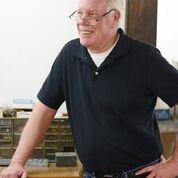 Jim has trained over a dozen jewelers in the craft and performed the work for over 29 stores in Kalamazoo and surrounding areas. Anyone that knows jewelry in southwest Michigan, knows Jim Rose. Jim Rose continues to provide oversight and recommendations to the store. Biography: Born in Kalamazoo, MI in 1953. Raised up on the East side of Kalamazoo where he graduated from Hackett High School. After spending 3 years in the Navy he went to work for Carl V Reck jewelers in the downtown mall. In 1980 he decided to open his own jewelry repair business. Jim purchased the original Ample Pantry and turned it into a small repair shop. With over 40 years of experience in the industry, he has become the go-to jeweler for our community. If Jim isn’t at the shop, you will find him working on old corvettes, on a golf course, or hanging with his dog Sam. Credentials: Jim has worked on and off with his father since he was a child. He is a Certified Bench Jeweler through the American School of Jewelry and has multiple certifications through the Gemology Institute of America. Jim now manages the store and performs the bench work for Rose Jewelers. He intends to carry on the Rose Jewelers family tradition for another 40 years. Biography: Jim Rose was born in Kalamazoo, MI in 1986. He grew up in Mattawan, MI until high school when he moved to Delton, MI where he was an elk farmer and bailed hay. After high school he went on to earn a Bachelor’s degree from Ferris State University in Construction Management, which landed him a job in Houston working for a construction management firm in the oil industry. For the next 7 years he traveled across Canada and the US constructing pipelines, oil refineries, and oil distribution tank farms. In August of 2014, he decided to quit his career and come home and be part of the family business. Jim went back to school to get certified as a bench jeweler and has been helping manage the business and bring it in to the modern technology world. Jim’s goal is to help bring some new age technology to an already great business. When he finds time, you will find Jim camping, hiking, kayaking, fishing, riding his Harley, or playing in the garden. Our wonderful afternoon helper. The pretty one of Rose Jewelers. She’s the professional that fills in for us when we are gone. Keeps the place looking good and running smooth. Our friendly red lab. Big ol teddy bear, and doesn’t miss a snack. Our little rescue mutt. More energy than a kid on candy!